Templates for statistical reports – spoon-feeding? Here is the poll for today. Indicate what you think, then read what I think. For many years I asked students to write up their results and then was frustrated when their reports were incomplete, incorrect, imprecise, incomprehensible or all of the above. It then struck me that I was asking them to do something that I hadn’t taught them to do. It was like asking them to assemble a complicated piece of furniture, giving them only the box of parts, with no instructions, then complaining that the end result was poorly constructed. So now I give them a pattern. It comes in the form of a set of questions in the Learning Management System, where they are required to fill out the template after performing the analysis using Excel. There are several sets of data for the students to practice on. From it they gain immediate feedback. 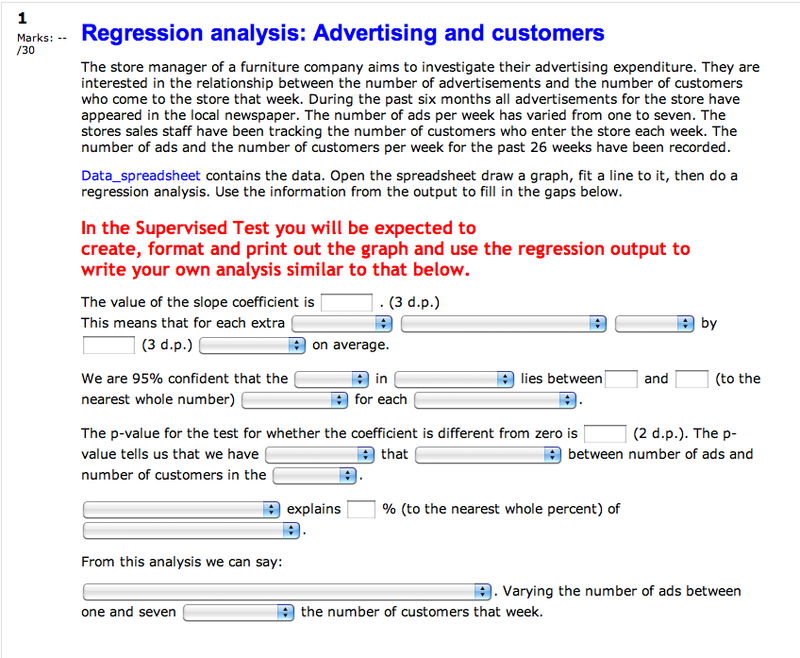 An example of the type of question we use to teach how to write up a regression analysis. The dropdown boxes provide alternatives, and numbers are entered in the open boxes. In the final assessment students are given data to analyse using Excel, and they write up the results without prompts. The students often memorise the template, and use it to write a correct, clear, complete, comprehensible report. The standard of write-up has improved markedly, and I no longer get frustrated at reading poor reports in the final assessment. Some students still manage to avoid learning and write non-sensical sentences, but the proportion has reduced considerably. So am I right? I believe I am. Even if the students don’t completely understand what they are doing, they can at least produce something correct. They are aware of statements that are incorrect, as they were penalised for them in the practice exercises. How many of us really do understand all about techniques we use, especially at the start? Templates give students a correct recipe to work from so that they build on a sound foundation. If there were enough time in a course, you could get the students to work out a template as a class, or individually, giving them feedback as they go. Please let me know if you disagree or have concerns about the use of templates. It’s really good to have opposing views aired. And maybe you will convince me to abandon my templates! For students of statistics reading this, you can find my recommended pattern for writing up a regression in the YouTube video on regression. I tend to feel that variance has a specific meaning, as in the square of the standard deviation. When we are trying to make a concept understandable, it seems helpful to use more everyday words when possible. Dr. Mary Whiteside (UTA) had us do the same i.e., a sort of template for reports in her statistics courses, which was a great lifesaver….one needs all the help one can get while learning the ropes. Precision is worth the cookie-cutter solution. 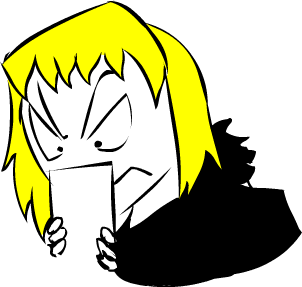 Unless you have the student in front of your while grading it is way too tedious to write out all the comments, and hope that the student reads and understands. In a class of 40 plus sophomores, it seems like a lot of effort that may yield little payback. Yes i agree with you on giving a template.Because I used to teach my students “Research methods”.It has assignments where student has to write on different chapters.So I give them sample format or template.It becomes easier for both the teacher and the students.